There are two ways to listen to this music. First, you can click on the link provided which should (in most browsers on most operating systems) launch an embedded MP3 player. The MP3 download may or may not keep pace ahead of the music and so you may need to wait a bit, then replay it. Second, you may simply download the MP3 file to your computer by right-clicking on the link provided and choosing Save Target As... in Internet Explorer or Save Link As... in Firefox. Internet Explorer seems a more graceful master of the first of these two methods than Firefox although Firefox performs the second step flawlessly. The Central Stake choir for that occasion numbered about 25 singers. 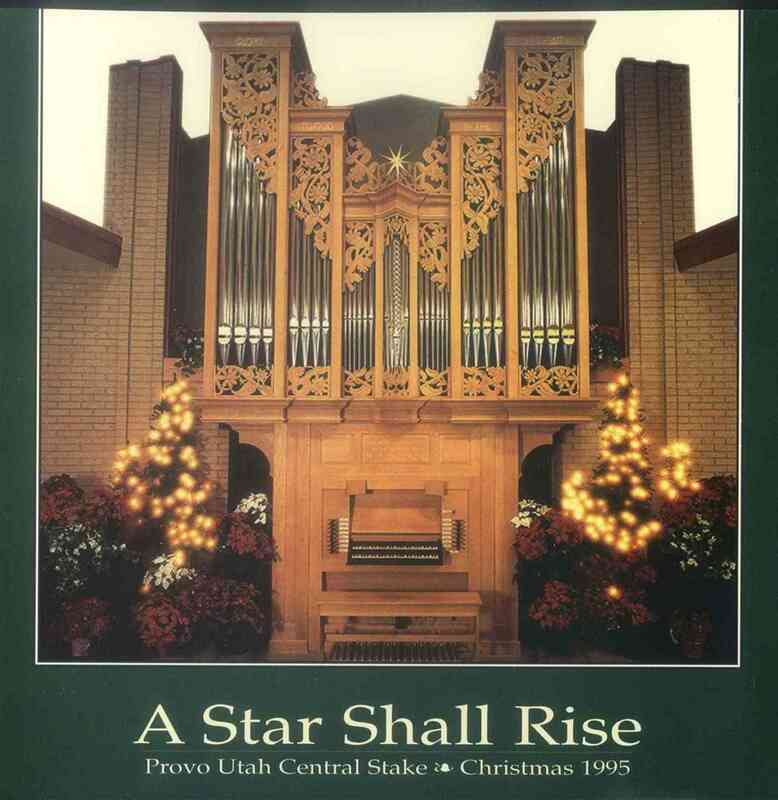 During the intervening years the concert series has continued and the annual Christmas concert has become a significant part of the holiday season, not only for the Stake, but for the community as well. Since the first concert, this celebration of Christmas music has begun, just as the service of its original inspiration, with the traditional carol, Once in Royal David's City. Three additional carols, Silent Night, Hark! the Herald Angels Sing and O Come, All Ye Faithful (usually sung by the choir and congregation in the actual concert setting) are included, as sung by the choir alone. The musical selections span several centuries and have never been identical from year to year outside the carols already mentioned. This year, earlier repertories are represented by Of the Father's Love Begotten and O Come, O Come, Emmanuel (based on early chants); Unto Us Is Born a Son, a work based on a late medieval tune, Es ist ein Ros' entsprungen, a famous German carol publish in 1600; and finally, the hymn, O Jesu, Sweet Child, harmonized by Johann Sebastian Bach in the early XVIIIth century. Folk hymns and melodies have long been a part of Christmas celebration. Still, Still, Still and All Poor Men and Humble reflect the folk traditions of Autria and Wales respectively. 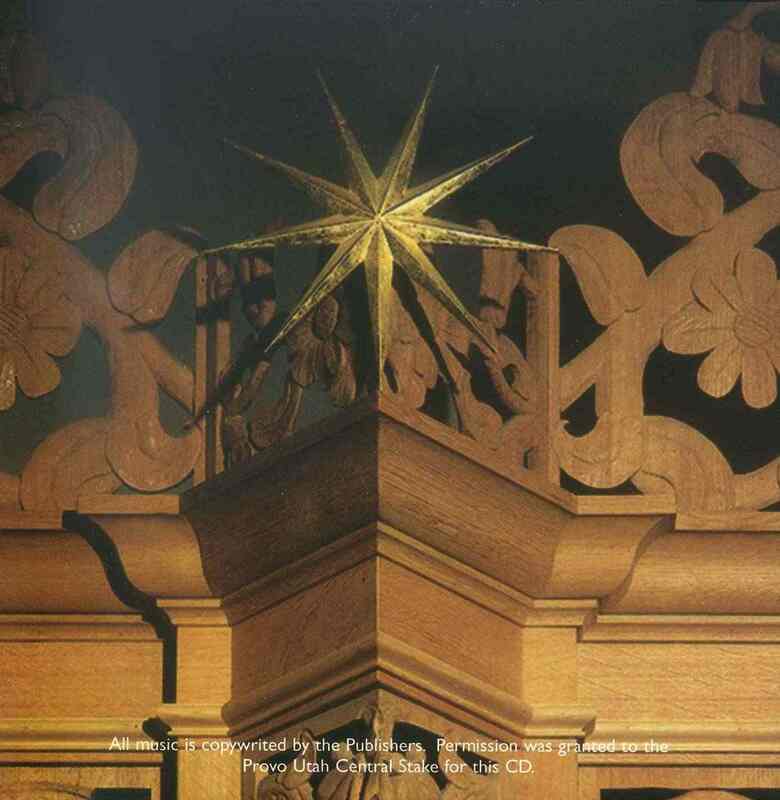 Mendelssohn's famous Christmas anthem, A Star Shall Rise Up out of Jacob, represents the XIXth century German choral tradition. The remaining works have been written in the XXth century and exemplify the diversity found in music by contemporary composers. Ranging from the quiet simplicity of Jesus Christ, the Apple Tree (based on a late XVIIIth century American folk tune and an anomynous text from that period) to the more contemporary sound of Boston composer Daniel Pinkham's engaging piece, Evergreen, these compositions continue the age-old adoration of the Chist Child and urge humanity to further the work of the new-born King, the Prince of Peace. 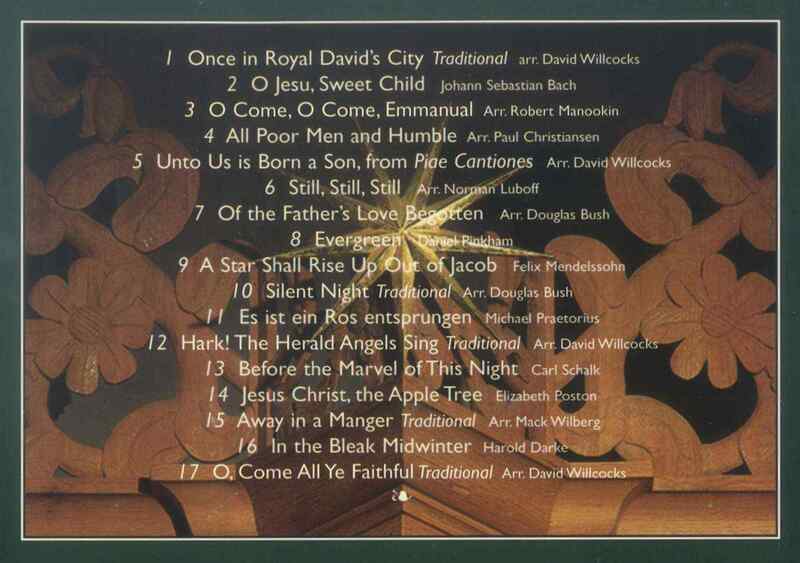 Now in this seventeenth year of the concert series, the decision was made to record representative selections drawn from the music performed in the Christmas concerts and make the recording avaiable on compact disc (a similar recording made in 1991 was produced in audio cassette format). 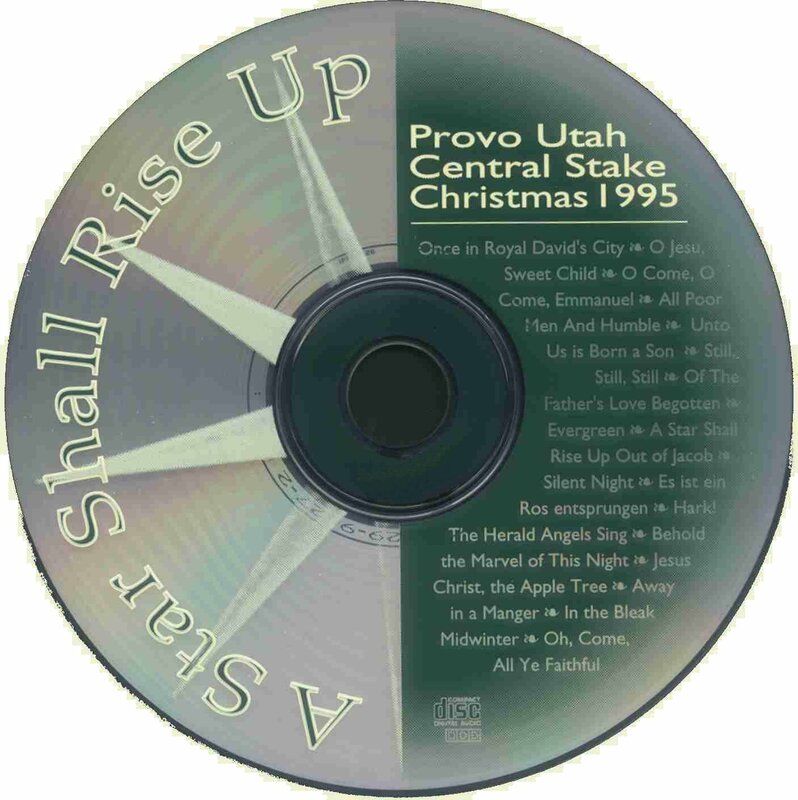 Recorded October 21, 1995 at the Provo Utah Central Stake center, the Choir for the 1995 Christmas concert numbers approximately eighty singers with most of the stake's twelve wards represented. (23) Emma C. Aldrich, Kristine M. Anderson, Sylvia C. Betts, Holly Casos, Rebecca Claire Bush, Gayle Conant, Carrie Elzea, Trina C. Fegan, Dannie Graves, Carolyn Greenwood, Jenylyn Grierson, Maren Hale, Rachel Laura Harmon, Barbara Jibson, Heather Lynn Kunz, Christine Moss, Lujean Moss, Jennie Nichol, Christian J. Richter, Tonja Roberts, Diana Sanzana, Barbara Sudweeks, Janice C. Tomkinson. (26) Leuzi Z. Cardoso, Joan Christensen, Robyn Cootey, Allison V. P. Coutts, Carol Dean, Jean Ellsworth, Vinetta Eyre, Teresa Griffin Fairbanks, Lindy Louise Glenn, Debra Gooch, Susan Kay Harris, Sara "Jamie" Jameson, Bonnie Knowlton, Marian Kaye Manuele, Lorraine McGuire, Wndy Seiter Nichol, Doris Cay Olpin, Michelle Parrott, Connie Robinson, Claire B. Rogers, Carol Sanchez, Jamille Adams Sanford, Carolyn W. Smith, Margaret Sperry, Melissa A. Young. (10) Jeffrey D. Anderson, Michael Austin, Todd A. DeGraw, Robert P. Dyer, Stephen M. Graves, Eric C. Huntsman, Tracy R. Lofthouse, Chad N. Lowe, Micheal Shumway, William Wilcox. (14) James Anderson, Russell Bateman, Andres Diaz, J. Orlo Eyre, Gregory Tanner Fairbanks, Daniel Jepson, Kevin Kunz, Jamie Nichol, Irwin Purcell, Jim Robinson, Jeff Sanford, Ray Sudweeks, Dan Urban, Art Young.